The Boston University men’s hockey team knocked off the University of Massachusetts at Lowell in a series-clinching 4-1 win on Sunday at Lowell’s Tsongas Center. “I thought we played a good hockey game from start to finish,” said BU head coach Albie O’Connell. Having split the weekend’s first two games, the teams met for a third time on Sunday to determine who would be advancing to the TD Garden for next week’s Hockey East semifinals. “We’ve been in this situation before,” O’Connell mentioned, referring to BU’s experience in win-or-go-home contests. Saturday’s Game Two finished on a physical note, as brawls broke out after nearly every whistle late in the contest. Going into Game Three, it was clear that some bad blood had developed between the two teams, making the series-decider all the more contentious. “We knew it was going to be a really physical and tough game,” said freshman forward Joel Farabee. Among the aggression in Game Two, senior forward Bobo Carpenter took a hard hit in the final seconds, resulting in a suspension for UML forward Lucas Condotta. Carpenter’s status was uncertain on Sunday morning, but at game time, the captain was right there to take the opening draw. UMass Lowell opened the scoring 3:37 into Saturday’s Game Two, but BU one-upped the hosts in Game Three, striking first at the 2:34 mark. Flooding the RiverHawk end, junior forward Patrick Harper fed classmate Chad Krys joining the rush from his defensive position. The assistant captain made no mistake, scoring his first goal of the series to get BU off on the front foot. “We came out fast and they didn’t,” Farabee said. The Terriers nearly made the lead two just past the period’s halfway point on a redirection by sophomore forward Logan Cockerill in front that got by netminder Christoffer Hernberg. However, the goal would be disallowed, as Cockerill had tipped the puck with a high stick. It would not take the Terriers very long after the Cockerill chance to find their second tally, with freshman forward Joel Farabee coming through for his fourth goal of the series. Krys became the provider on this occasion, moving the puck to Farabee as the clock ticked towards eight minutes left in the frame. Gaining the line, the first-year phenom found space near the right dot, and fired one by Hernberg to double the Terrier lead. Sensing blood in the water, BU threatened on a power play with 3:39 left in the period, with sophomore forward Ty Amonte getting a pair of point-blank looks. While the Terrier man advantage was unsuccessful, BU wouldn’t have to wait long for their third goal. Junior forward Patrick Curry had set up the two Amonte attempts, and the third try proved to be the charm. 13 seconds after the power play expired, Curry found Patrick Harper, who whipped it home from close range to pot his first goal in six games. Lowell head coach Norm Bazin had seen enough, and Hernberg was replaced by New York Rangers prospect Tyler Wall, who had been the victorious netminder in Game Two. The first period defensive effort from BU was just as impressive as the attacking output. The RiverHawks were held to just three shots on goal in the opening frame, with none in the final 12 minutes. “We didn’t generate enough shots tonight,” Coach Bazin admitted. With all the wind in their sails, BU took a 3-0 lead into the first intermission. It was sweet revenge for the visitors, who had been stunned on Saturday night by three first period goals from the RiverHawks. “It was one of the best first periods we’ve had all year,” said O’Connell. Having built up a three-goal advantage, the Terriers were content to sacrifice attacking threats in order to protect the defensive end. BU only attempted eight shots on target in the second compared to 15 in the first, but also held Lowell to eight in the process. Junior goaltender Jake Oettinger was rock-solid in the BU net, calmly turning away RiverHawk efforts from all angles. The assistant captain’s finest stops of the frame came on a double-save to first deny forward Connor Sodergren, and then keep out forward Nick Master’s follow-up opportunity. “I thought their goalie made a couple really good saves,” Bazin noted regarding Oettinger. While Oettinger’s timely saves were crucial, the Terrier defense was equally responsible for the clean sheet through 40 minutes. BU’s skaters tallied a whopping 8 blocks in the period to match Oettinger’s save total from the middle frame. “They earned it,” said Coach O’Connell of his Terriers. With forty minutes in the books, BU’s 3-0 lead still stood, and so did their lopsided shots on target advantage, which had become 21-11. With the hosts growing desperate as time in the third period ticked away, the RiverHawks found hope with their first goal of the game with 12 minutes left in regulation. With forward Connor Wilson holding the puck high in the attacking zone, the UML captain zipped a pass to forward Kenny Hausinger between the dots. The junior carried the puck to shooting position and found the top right corner to bring the score to 3-1. Unfazed by the Hausinger score, Oettinger the skaters in front of him regained their rhythm, keeping Lowell to the lone goal as the RiverHawks turned up the heat seeking a late comeback. “We couldn’t convert,” said Bazin. With Wall having vacated the UML crease, the Terriers defenders would deservedly be rewarded in the final minute. Withstanding RiverHawk pressure, BU gained possession and quickly turned defense into offense. Cockerill led the break towards the gaping net, and unselfishly laid the puck off to a trailing Harper to tap home, completing the three-point night and securing the BU victory. The teams would skate out the final 52 seconds, and BU emerged victorious – 4-1 in the game, and 2-1 in the series. “It’s no mistake that we came out and took care of business today,” Farabee claimed after the game. The series win marked the eighth consecutive season in which the Terriers were able to advance beyond the first round of the playoffs. BU will move on to the TD Garden in Boston for next Friday’s Hockey East semifinals, taking on Northeastern with a spot in Saturday’s tournament championship up for grabs. The BU men’s hockey team will meet UMass Lowell today for Game 3 of the Hockey East Quarterfinals at Tsongas Center, playing for a ticket to the TD Garden next week. After the Terriers took Friday’s Game One 3-0, the RiverHawks responded with a 6-4 win in Saturday’s Game Two, setting up for a pivotal Game Three this afternoon. Tensions ran high towards the end of last night’s contest, with late brawls taking over the game. BU co-captain Bobo Carpenter came up lame after an ugly hit in the final seconds from UML’s Lucas Condotta, who was suspended for Game Three. It’s win or go home today, and the game is shaping up to be a wild one. Don’t miss any of the action by following our live blog for minute-by-minute updates and conversation about the game! Puck drop is set for 4pm. Returning to the University of Massachusetts at Lowell for Game Two of the Hockey East Quarterfinals on Friday night, the Boston University men’s hockey team turned in a valiant effort, but ultimately could not catch up to the hosts, who took the contest, 6-4. The RiverHawks (19-12-5) were playing for their lives on Saturday night, as BU (15-17-4) had taken the series opener on Friday night, 3-0. As Friday’s rematch progressed, it became clear that the second contest would not be a repeat of the first. “It was a lot different than last night,” O’Connell acknowledged. After being held goalless in Game One, the RiverHawks came out flying in Game Two, scoring their first goal of the series just four minutes after the opening puck drop. On the game’s first power play, defenseman Chase Blackmun received a pass from forward Reid Stefanson and unleashed a seeing-eye rocket from the point that found its way through a crowd and into the Terrier net. “It’s easier leading than chasing the game,” said UML head coach Norm Bazin, emphasizing the importance of getting on the board first. BU reacted well to the early deficit, coming closest on a drive from freshman forward Joel Farabee that clanked off the iron. However, despite the Terriers’ energy, the game’s next goal would come for the hosts. Just past the period’s halfway point, BU conceded two overlapping penalties. The Terriers survived the majority of the five-on-three situation, but in the final seconds, forward Connor Wilson fed forward Ryan Dmowski in front, who pounded it home to make the lead two. “I think the referees got involved early,” said O’Connell, reacting to the four penalties called against his team in the first period. 63 seconds after the Dmowski goal, the RiverHawks would pot a third, equaling BU’s total from a night prior in just twelve and a half minutes. Dmowski was a provider on this occasion, moving the puck to linemate Charlie Levesque, who then set up forward Kenny Hausinger to fire it in from the right of BU junior netminder Jake Oettinger. The Terriers would manage a few threats late in the period, but could not cut into the deficit through the opening 20 minutes. Despite holding an 11-9 advantage in shots on goal, the visitors trailed 3-0 going into the first intermission. “I thought we outplayed them in the first period to be honest with you,” O’Connell said. If three first period goals on Saturday after none in Friday’s contest foreshadowed a Game Two goal-fest, the second period provided all the evidence that the game would, in fact, be a high-scoring affair. BU kicked things off in the middle stanza with a power play goal just 1:19 into the frame, as junior forward Patrick Curry knocked in a slap-pass from sophomore defenseman David Farrance. Junior forward Patrick Harper was awarded with the second assist, and BU had their first goal. The two-goal advantage was restored by UML on a power play of their own two minutes later, with the red-hot Dmowski taking a pass from Hausinger, slipping through the Terrier defense, and picking the corner to make the score 4-1. “[There were] some catastrophic mistakes on our part defensively,” said O’Connell. Down by three, BU rallied for two goals in quick succession, both coming with the Terriers gaining the benefit of an extra skater. The first of the pair came with a delayed penalty called against UMass Lowell and the sixth attacker on for BU. Sophomore forward Shane Bowers set up classmate defenseman Cam Crotty to line in a bullet from the left circle, scoring his second goal in as many games. On the ensuing power play, it was Joel Farabee who found the back of the net on a brilliant individual effort. Carrying the puck into the zone himself, Farabee caught a sight of goal and took advantage, launching the puck to the top shelf to bring the Terriers within one at 4-3. The offensive storm continued, as UML added their fifth a minute later. With a centering pass from down low, forward Ryan Lohin found Stefanson, who dangled his way across the goalmouth to flip it in and bring the lead back to two at 5-3. “The guys did a great job of responding,” said Bazin. With five minutes to play in a five-goal period, the fireworks were not done just yet. UML were given another man advantage, but this time, it was BU who lit the lamp. Catching the RiverHawk power play unit committed too far forward, BU counterattacked through Farabee. The freshman made the most of his third breakaway chance of the night, beating netminder Tyler Wall to pot his third goal of the series and make the deficit one again. By the time the dust settled on a wild middle 20 minutes, the Terriers were still down 5-4, but held the momentum with the four second period goals and 25 shots on goal to Lowell’s 18. While the tides had been turned in BU’s favor in the second, UMass Lowell were quick to squash the visitors’ excitement with their sixth tally in the opening minutes of the third. After a long attempt by defenseman Matthias Goransson took a deflection in front, the puck fell favorably to forward Nick Master, who slid it past Oettinger to put UML up 6-4. “That ended up being a little bit of a back-breaker,” said O’Connell of the Master score. Holding the two-goal cushion in the third, Lowell turned their focus to the defensive end, quieting the Terrier attack as time ticked away. BU pushed for a final flurry with the net empty, but Wall and the RiverHawk defense were flawless when it mattered. “You can’t keep coming back,” said O’Connell in regards to his offense stalling in the game’s latter stages. The game would get scrappy in the waning minutes, with multiple scuffles breaking out on both ends of the ice. BU senior forward Bobo Carpenter took the worst of the late physicality, getting shoved into the boards from behind with less than ten seconds to play. On the opposite bench, Coach Bazin saw the aggression a bit differently. When the final buzzer finally sounded, the RiverHawks had outlasted BU to claim a 6-4 victory and extend the series to a pivotal Game Three. “We live to fight another day,” said Bazin. The series-deciding matchup will take place on Sunday at 4pm, with the winner advancing to next week’s semifinal at the TD Garden. 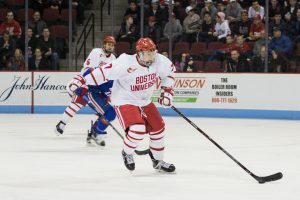 In the opener of a best-of-three Hockey East quarterfinal series on Friday night, the Boston University men’s hockey team skated to a convincing 3-0 win over the University of Massachusetts at Lowell. There was little to separate the two teams in the game’s early stages. BU (15-16-4. 13-9-3 Hockey East) claimed the immediate territorial advantage, putting up three shots on target in the first three minutes. “It was good to get off to a good start,” said O’Connell, whose Terriers were looking to rebound from a 6-0 thrashing at the hands of the University of Maine in the regular season finale last Saturday. UMass Lowell (18-12-5, 12-8-5 Hockey East) were able to gain ground as the period wore on, challenging the Terriers with physicality on both ends. “It’s…the playoffs, so they’re going to be a bit more physical,” said freshman forward Joel Farabee. The back-and-forth play was mirrored by the nearly identical first period efforts of both goaltenders. BU junior Jake Oettinger comfortably turned aside the seven shots against him, while UML senior Christoffer Hernberg stayed perfect against eight attempts. Hernberg’s greatest scare came in the final seconds of the frame, when BU junior forward Patrick Curry found space in the slot and ripped one that the keeper fought off with the blocker. “Our forwards were committed to playing the right way,” said Coach O’Connell of his attacking contingent. Despite the high energy from both sides, the scoreless deadlock could not be broken through twenty minutes, and the teams retreated to the locker rooms still awaiting the opening tally. “It was a hard-fought game,” O’Connell said. After a goalless first period, it did not take long in the second for the game to find a score. It was BU who drew first blood, getting on the board six minutes into the frame. After a pass from sophomore defenseman Kasper Kotkansalo, fellow blueliner and junior co-captain Dante Fabbro fired away from long range. Drifting inside the left circle, Farabee got just enough of his stick on the shot to beat Hernberg with the redirection. It was the first collegiate postseason goal for the Philadelphia Flyers prospect, who led the team in both goals (13) and points (31) at the conclusion of the regular season. With the 0-0 draw broken, the game began to open up. The Riverhawks peppered Oettinger from up close throughout the second half of the frame, but the Minnesota native could not be beat, racking up 21 saves through forty minutes. “From the drop of the puck, [Oettinger] was locked in,” said O’Connell. With the ice tilting towards the Terrier end, BU gained a lifeline through the game’s first penalty with two minutes to play in the middle stanza. It would not take long for the BU power play unit to take full advantage and double their lead. Soaring into the attacking end, sophomore defenseman David Farrance found a soft spot in the four-man Riverhawk defense and drove straight in on Hernberg. With the keeper committed, Farrance fed classmate and fellow defenseman Cam Crotty at the far post, who buried it easily. The tally was just the fifth of Crotty’s collegiate career, with three of the five coincidentally coming against UMass Lowell. Farrance’s assist also marked his 20th as a Terrier. BU trailed in shots on goal 21-17 after forty minutes, but the Terriers had their heads held high, taking a two-goal advantage into the second intermission. “We had a lot of energy, said O’Connell. BU carried the momentum through to the final frame, showcasing their impressive penalty kill early in the period by keeping the RiverHawks at bay on their only power play opportunity of the night. “We just played smart,” Coach O’Connell said. The Terriers nearly sealed the victory towards the halfway point of the period on a breakaway for sophomore forward Ty Amonte, but Hernberg read the forehand-backhand move. Chances proved to be scarce for BU in the third, but the Terrier defense was solid when called upon. The RiverHawks poured on pressure in the game’s waning minutes, but could not reach the back of the BU net. With several shots finding bodies in front and sailing wide, Lowell managed only four shots on target in the final frame. “Our forwards and [defense] did a good job of blocking shots,” said O’Connell. Surviving a final push from the RiverHawks, the third Terrier goal would come with the clock ticking into the minute to play, and the Lowell net empty. Securing possession in his own zone, Farabee whipped the puck deep into the RiverHawk end. Patrick Curry won the footrace and slid the loose puck across the line, notching his 12th goal of the season and putting the finishing touches on BU’s impressive win. The Terriers would finish on top 3-0, taking the upper hand in the series. “We played hard tonight,” O’Connell said. Jake Oettinger’s 25 saves were by no means his most heroic as a Terrier, but the performance was still significant for the Dallas Stars draftee. With the flawless night, Oettinger tied the program’s all-time record for total shut-outs (13). BU will return to Tsongas Center in search of a series-clinching victory on Saturday night. With the hosts on the brink of elimination, the Terriers know that earning the series sweep will not be easy. “They’re going to be playing for their lives,” said Farabee. Game Two is set to begin at 7pm on Saturday, with a potential Game Three scheduled for Sunday if necessary. The regular season is over, and the postseason has begun! BU will face off against UMass Lowell in Game 1 of the Best-of-3 Quarterfinal series tonight at Lowell’s Tsongas Center. The fifth-seed Terriers were trounced 6-0 in their regular season finale by UMaine, surrendering their bid at home ice for the series with fourth-seed Lowell. However, the Terriers went unbeaten in their five games prior, and are looking to make another improbable Hockey East tournament run like they did last season. As for the hosts, Lowell limped across the finish line, concluding their season with a stretch of seven games that only featured one win. While the RiverHawks did beat BU 5-3 in the teams’ first meeting back in December, the Terriers got the best of UML 5-2 in the reverse fixture at the Tsongas Center the next night. The playoffs are here! Don’t miss a second of the action tonight by joining our live blog for constant coverage and conversation throughout the game! Puck drop is set for 7:15pm. We’re live at the Tsongas Center for what should be a thrilling top-10 clash between two Hockey East squads. Come 7:15, the No. 3 Boston University men’s hockey team will take on No. 9 University of Massachusetts Lowell, and these squads never disappoint. They met back on Jan. 28, with the Terriers earning a 4-2 win. Will more fireworks be on display tonight? Let’s find out together – so follow along in the live blog below! A stern test awaits the No. 3 Boston University men’s hockey team, as it’ll visit No. 9 University of Massachusetts Lowell on Friday night. Rumor is the Tsongas Center has been sold out for weeks, and rightly so with two of the NCAA’s elite teams duking it out. For context, they met back on Jan. 28, with BU earning a 4-2 win over the River Hawks. Ahead of this game, Jonathan wrote his usual preview, so be sure to check that out over on The Daily Free Press. As tough as Lowell will be, it’s hard not to look ahead to Monday night’s Beanpot title game vs. No. 4 Harvard University. Despite that, freshman goaltender Jake Oettinger stressed that the Terriers are staying in the moment. For more from Oettinger and head coach David Quinn, click the link above. Set aside frustrations, as the sky is not falling in the land of Terrier hockey. Pegged against No. 7 University of Massachusetts Lowell, the No. 1 Boston University’s men’s hockey team grinded its way to a 4-2 win Saturday night at Agganis Arena. While it’s impressive enough that BU knocked off Lowell, the main storyline is that it nipped its two-game skid in the bud. The Terriers were previously swept by Merrimack College, and head coach David Quinn was visibly frustrated with his player’s mental approach. However, thanks to 33 saves from freshman goaltender Jake Oettinger, two goals from sophomore forward Bobo Carpenter and two points from freshman forward Clayton Keller, BU returned to form. The most impressive part, arguably, was that the Terriers opted for a blue-collar approach, saying sayonara to fancy stickhandling and cute passes. For a full recap of the game, check out Shelby’s story over on The Daily Free Press. Oettinger was stellar, too, and Jonathan wrote about his performance. Chabot and Curry are unreal for "afterthought" freshmen.